To download your survey, click here. Thanks so much for taking the next step. You obviously have a desire to learn more about this important topic. As we begin, I wanted to say that the things we will look at are really challenging. I know because I have felt some pretty strong feelings as I learned the things you're about to learn. Please understand that I am submitting these ideas to you with the utmost love and respect. I hope you will feel like that comes through as I make my case. In the last video, we talked about a Biblical Plan of Salvation. I said that this plan was hidden in the Bible, and in plain sight. I said, even the most learned scholars miss it and, even explained why they miss it... they do not have the heart of a child. I'm about to show you that Biblical plan of salvation, but before we begin, let's lock down some of the basic Bible grammar used to define the plan. You probably know most of this but let's take a minute to lock it down carefully. This way, there will be no confusion or disagreement about terms and definitions. Let's take a look at this phrase, "God's Plan of Salvation." First, let's be clear. This is God's plan, not man's plan. Man did not create the plan and man can not change the plan. The plan was clearly established in the Bible 2000 years ago and is the same today as it was in the first century. What is a plan? Well, Webster's dictionary defines the word "Plan," as a detailed proposal for doing or achieving something. So our plan will contain some sort of ordered actions aimed at achieving the goal, which God has laid before us, salvation. The Biblical plan of salvation may be depicted like a series of stair steps. Now, I need to stop right here and make sure we understand something important. These steps I am describing are not actions we take in order to be saved but they are observable, verifiable things that happen with us as we move through the plan. We are not talking about some kind of "works salvation" here. You'll understand this clearly as we move forward. Ok, this brings us to our next term... salvation. Salvation is a good religious word. What is salvation? Turning to Mr. Webster once again, we see that salvation means, deliverance from sin and its consequences. There is another phrase, common in the religious world, called "Born Again." This phrase is another way to say saved or sins have been forgiven. So, born again, equals saved. There is no difference between these two phrases. Here's another important point about salvation... there is no gray area. Someone is either lost or saved. We are either in the light or in the darkness. We are never kinda saved or a little saved or sort of born again. Here is something which is a little humorous. Have you ever heard of someone referring to themselves as a born again Christian? Did you know there is no such thing as a born again Christian. Those are redundant terms! That would be like saying, I am a white caucasian! What other kind of Caucasian is there? Any one who is born again is a Christian. Here's the next term: Christian. A Christian is someone who is in a saved state. And the Bible teaches only Christians are saved. People who are not saved are not yet Christians but they are certainly eligible to become Christians. This is an incredibly important definition to understand. The meaning of this word, Christian, has become a extremely blurred in our religious and non-religious worlds. Many people refer to themselves as Christian even though they have never had a "Salvation Experience." People who simply believe in Jesus often call themselves Christian. Since they are not Buddhist or Muslim or Jewish, they are Christian, at least, that's the box they check on those forms they give us from time to time at the DMV or emergency room. 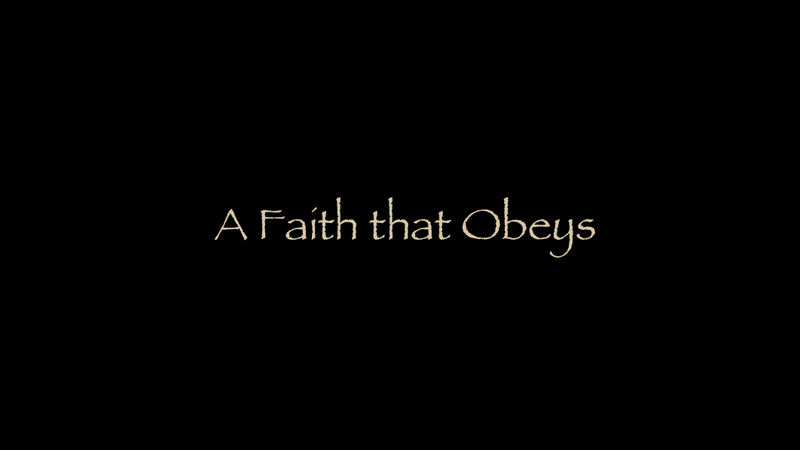 In this series, "A Faith that Obeys," we will reserve the word "Christian" exclusively for people who are in a saved state. It is possible to believe in Jesus but never make a commitment to Him. We will call these people "believers" in order to establish a distinction. What is sin? Sin is defined as a transgression against God and His law or commands. Sin is that spiritual thing that separates us from God and makes us feel guilty. one, our sins are forgiven and two, we will go to Heaven when we die. These two things are absolutely sure for every true Christian the hope of Heaven and the forgiveness of sins. When our sins are forgiven, they are removed or wiped away, by God. He is the only one with the power to forgive sin. As we progress in our studies, we want to hunt for the exact point in time when that event occurs... the forgiveness of sins. At the point in time when this occurs, we would say that we are now saved. This is another really important term. What does saved mean? The same thing as salvation. Saved means, saved from our sins and it's consequences. Saved means we have received that free gift of eternal life. This is exactly what happens every time someone is saved. So, saved is another really important term on which we must absolutely agree. One is not in a saved state if their sins have never been forgiven. Let's apply a little logic to this matter and tighten down our definetion. If someone's sins have never been forgiven, they are not saved. This means they are not yet a Christian no matter how far along in their spiritual journey they may be. If sins have been forgiven, that person would be saved and we could call them a Christian. We should also conclude everyone who is going to Heaven has had their sins forgiven and no one in Heaven will still have their sins intact. They have been removed forever. This is a super basic Christian doctrine. Without the forgiveness of sins, there is no life and we simply can not call someone who's sin is still intact - saved. It would make no sense. So if we made up a little equation to illustrate the point, we would see that Christian equals saved equals sins forgiven. These mean the same thing. There is no such thing as an unsaved Christian or a Christian who has never received the forgiveness of their sins. This is why we use the term, "believer" for folks who may love Jesus but have never obeyed the Gospel. Some people illustrate sin as a great wall that separates man from God. If that wall is never knocked down by God, man would have no access to Him. At the exact point in time when God destroys this barrier, we begin our saved relationship with Him. This term saved is what this entire series is about. At what point on our spiritual journey are we saved? And what does saved really mean? As we progress through these lessons, it will become clear; there is a very specific time and place salvation occurs. This is our goal. To clearly identify that point in time. Try to determine that point in time, in your life, when you were saved... if you believe you have been saved. In order to help you pinpoint that moment in time, I have prepared a brief survey you can download and print. After you complete the survey, you should file it away for future reference. It will become very important at the end of these lessons. Click the link below this video to download a copy of the survey. If you are watching this video on some other channel other than the main site at "afaiththatobeys.org", then visit the main site directly to download the survey and watch the rest of the lessons. That site again is www.afaiththatobeys.org/survey. Click the link or visit the site to download your copy of the survey. I have made this a printable survey so you can know it is completely confidential and the website is collecting no information. Well, now that we have our grammar established, let's talk about the plan of salvation as it is generally presented in modern Christianity. We'll do that next, but don't jump ahead until you get your copy to the survey and fill it out.